Having set the challenge to celebrate We Should Cocoa’s 2nd birthday with cocktails, I was subsequently completely flummoxed as to what to make. I know nothing about cocktails, except that I’m usually happy to drink one when it’s offered. I wanted to do something other than cupcakes, not because I don’t like cupcakes, but I thought there might be a proliferation of these and it would be fun to do something different. However, the days flew by and I was no nearer deciding what to make and then it was time to go back to work after my lovely three week break. Needing something to take back to work with me, I thought cupcakes would probably work best as they are less messy than a cake which needs to be cut with a knife. And it was National Cupcake Week too. So, my cocktail entry has turned out to be cupcakes after all. Following on from my Chocadoodledoo, I quite fancied making a cupcake version of the cocktail, using the peppermint schnapps I made earlier in the year. Seeing Jacs’s post for her After Eight cake, confirmed my decision – it looked so good. A little googling came up with a Chocolate Mint Rum cocktail which was similar enough for me and also meant I could enter these into Baking with Spirit, which happens to be rum this month. I based my recipe on the one I made for chocolate peppermint cupcakes a couple of years ago and tweaked it to make way for the rum and mint schanpps. I also changed the frosting by adding cream cheese and mint liqueur. Melted 85g unsalted butter with 100g dark peppermint chocolate (Co-op Fairtrade 51%) in a large pan over a low heat. Added 175g dark brown sugar and stirred until smooth. Beat in two large eggs. Sifted in 180g flour (1/3 wholemeal, 1/3 white, 1/3 buckwheat) with 2 heaped tsp cocoa powder, 3/4 tsp baking powder and 1/2 tsp bicarb of soda. Stirred in 2 tbsp yogurt. Poured 2 tbsp rum into a jug with 1 tbsp mint schapps and topped up to 150ml with water. Mixed this in until just incorporated. Spooned into 15 cupcake cases and baked at 180C for 17 minutes until risen and firm to the touch. Left to cool for 10 minutes then turned out onto a rack to cool completely. Creamed 50g unsalted butter with 130g sifted icing sugar. Added 3 tsp peppermint schnapps to soften and beat until well incorporated. Beat in 50g cream cheese. Topped the cupcakes with the icing and added Elizabeth Shaw mint batons to give a cocktail effect. I was really pleased with this experiment; I was aiming for subtlety with the mint and rum and this is what I got. CT described them as blowing hot and cold. The warmth of the rum came through like a tropical breeze to be quickly countered by a cooling menthol blast. In a moment of verbosity, he went on to say that the mint intensity had three stages: a hint of mint in the sponge, distinctly minty in the icing finished by a powerful burst from the chocolate baton. He recommended that the cake be eaten from the bottom up to enjoy the full experience. The sponge was moist and light and the cream cheese icing was delicious as was the rum chocolate sponge. Yum. Janine over at Cake of the Week has just started a new challenge, the most appropriately named Baking with Spirit whereby a different alcoholic drink is chosen to cook with each month. This inaugural month happens to be rum, so I’m putting these cakes forward. In honour of National Cupcake Week, the theme for this month’s Calendar Cakes, hosted alternately by Laura Loves Cakes and Dolly Bakes is cupcakes, so I can’t resist entering this one too. It’s unlike you Lucy not to come up with ideas, hope you manage it. These are right up my street – I’m a big fan of mint and chocolate combinations – and I love the way you’ve made them look like cocktails with the ‘straw’ sticking out of them. Thanks for entering Baking With Spirit! Hi Janine, thank you. Mint and chocolate is one of those classic winning combinations. Cute! Chocolate and mint is such a delicious combination. Thanks Alicia – rum seems to go rather well with them too. Ooh, yummy! 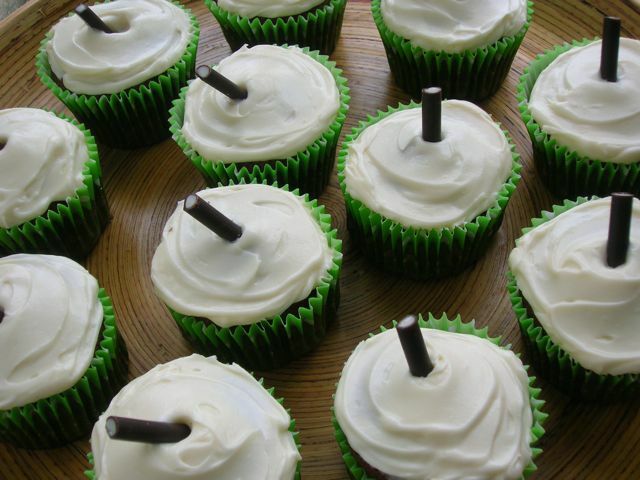 They look so pretty in the green cases and minty cream cheese frosting sounds great. Thank you, really glad you noticed the green cases, they didn’t show up in the photos as well as I was hoping. Thank you Debby – and an even better combination with rum too. As I read your post, I suddenly remembered that the salad I made tonight (a strawberry one with a chocolate dressing so I am sure you would be interested in it) had mint in the recipe I was looking at but I totally forgot about it! Thanks Johanna – salad sounds great, but you might just have to make it again to see what difference the mint makes. It’s gone cold and wet here, so salad doesn’t sound desperately appealing, but I’m waiting to try my chocolate balsamic out on some. Oh wow, oh wow – OH WOW! I adore them. I too, like the way CT has described these, they sound a total treat and look amazing. These are absolutely lovely!!! Good that I have peppermint schnaps at home. That is something to bookmark! I’m intrigued by your peppermint schnapps Chris – I didn’t even know there was such a thing! I didn’t know you could get peppermint schnapps. I should buy some reaaly as the combination of mint and chocolate is one I love. I used to love the YoYo biscuits in the 70s which these remind me of for some reason. I have yet to have a minty cocktail ever but would rather have one of these instead. Happy second WSC to you, cheers! To be honest Laura, I’m not sure you can either. I just made mine up. You are so right about YoYo biscuits, though I didn’t think abut it until you said. Oh all right then Dom, I shall wait until you get yours sorted – that’s my excuse for not getting the round up done soon anyway. Thanks for your lovely comment. I like dark peppermint chocolate, but I’ve never used for cooking. I read Jacqueline post about after eight cake too. Mint works very well with chocolate! These cupcakes look ready for the cocktail hour with the mint batons sticking out! Thanks Rita. This was a first for me too, but I love experimenting. Luckily, they turned out really well. Thanks Kit, it’s not an obvious combination, but it works. Great combination of flavours. Chocolate, mint and rum – you really can’t complain about that. I love the mint batons in the top. Thanks Phil, it’s an unusual combination that works surprisingly well. Goregous cupcakes – love how you’ve used rum and schnapps! Happy birthday WSC! Bravo! Lovely choccie minty things. They sound delicious. Great minds think alike with the chocolate mint combo then! These sound wonderful, Chocolette! I love that there are 3 stages to the mint, and the cooling and warmth combination with the mint and rum. I would absolutely love to try one of these! They do look tasty – although it would be a bit rude when I took 10 for myself.